Driven by several new and very popular models, Honda's sales rose 9.0 percent in April 2016 compared to April 2015. Driven by several new and very popular models, Honda's sales rose 9.0 percent in April 2016 compared to April 2015. With a total of 15,700 units sold last month, Honda is quite simply on a roll. Sport utility vehicles in the Honda range did very well in April. The 2016 Honda CR-V set a new sales record for April with 4,101 sales, while Honda Pilot sales increased by 9.0 percent. The 2016 Honda Civic remains the most popular car of the Honda range with 6,202 units sold, an increase of 10.0 percent compared to April 2015. 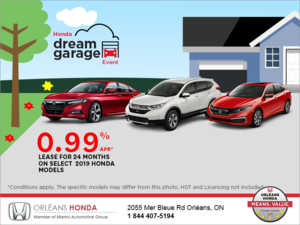 To learn more about the Honda range of new vehicles, contact us today at Orleans Honda!